SEATTLE, March 5, 2014 – Boeing [NYSE: BA] and Hainan Airlines announced a five-year pilot training agreement today to support Hainan’s recent introduction of the 787 Dreamliner to its fleet. 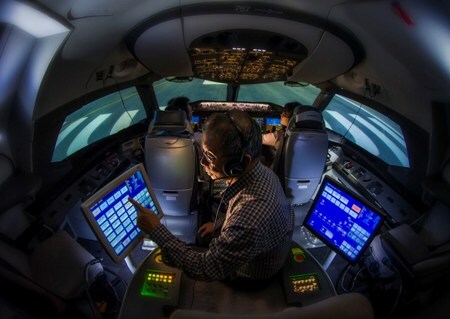 Pictured here, pilots train on a 787 full-flight simulator at Boeing Flight Services’ Singapore campus. SEATTLE, March 5, 2014 /PRNewswire/ -- Boeing [NYSE: BA] and Hainan Airlines announced a five-year pilot training agreement today to support Hainan's recent introduction of the 787 Dreamliner to its fleet. Under the agreement, Boeing Flight Services, a unit of Boeing Commercial Aviation Services, will extend the airline's existing contract for flight training at Boeing's Singapore and Shanghai training campuses on three Boeing models — the Next-Generation 737, 767 and 787. "The option of training campuses close to our headquarters and the training quality were the deciding factors in continuing our partnership, as is Boeing's unique knowledge and its ability to provide full training solutions," said Capt. Xing Tao, 787 fleet manager, Hainan Airlines. "When I look back to our earlier experiences with Boeing in Seattle and Kunming, I realize how the business and technology has changed and how together, we have forged a great and enduring relationship." The 2013 Boeing Pilot & Technician Outlook, a respected industry forecast of required aviation personnel, cites a demand for 192,300 new commercial airline pilots and 215,300 new technicians in the Asia Pacific region through 2032. "We are pleased to provide training to Hainan Airlines as they take a very exciting step in expanding their Boeing fleet," said Bob Bellitto, director, Boeing Flight Services Customers Group. "Providing our training expertise at two global locations closest to the airline gives Hainan a competitive advantage we call the Boeing Edge." As one of only seven airlines rated as five-star by Skytrax, Hainan Airlines is the fourth largest airline in terms of fleet size in the People's Republic of China. Its current fleet includes 118 Boeing airplanes. The airline serves scheduled domestic and international services on 500 routes from Beijing, Haikou and other operating bases on the mainland, and provides charter services. Boeing offers a comprehensive portfolio of commercial aviation services, collectively known as the Boeing Edge, bringing value and advantages to customers and the industry. Boeing Flight Services provides integrated offerings to drive optimized performance, efficiency and safety through advanced flight, maintenance and cabin safety training as well as simulator support and services through a global network of campuses on six continents. Boeing provides customers a competitive advantage by solving real operational problems, enabling better decisions, maximizing efficiency and improving environmental performance – intelligent information solutions across the entire aviation ecosystem.